Standing Liberty Quarter is very artistic US coin issued for circulation. On obverse, the Liberty standing on staircase with shield, and flying eagle on reverse. Most of earlier issues(1916 thru 1924) are tough to identify the date, because they had embossed(raised) date which wore off too easy. In 1925, Mint changed it to recessed date. On obverse at 7 o'clock. breathtaking rendition of an iconic design, and struck in pure gold(24K). Comes with beautiful package. issued at Denver and San Francisco Mint. Type 2 coin has covered breast and 3 stars under eagle. Type 1 coin has exposed breast and no star under eagle. 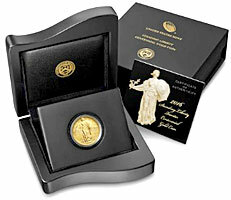 *Just 52,000 coins issued at Philladelphia Mint only.